When a Nanny’s salary is agreed as net, the true cost of employment is often far greater than anticipated. The total Employer costs can vary tremendously depending on the Nanny’s tax code and other factors. Unfortunately it’s not just a case of “add on 20% and that should cover it”. When agreeing a net salary (or paying an Employee on a free of tax basis), it is difficult to calculate back to the “true gross pay” figure from which the payroll calculation is based. Basically it’s a back to front payroll calculation and mistakes are common. Specialist payroll software is required. There are also the added complications of 3rd party deductions such as Student Loans and Attachment of Earnings orders. As the Employer, you have committed to pay your Nanny a fixed amount every pay day regardless of any other factors. Technically, this means you are then liable to make payments to these third parties on top of your total Employer costs! NB. in most cases where the nanny lives in as part of the family, the NMW does not apply. Outstanding tax owing: The Employer has agreed to pay the Nanny a set amount each payday. The employer is therefore liable for any underpaid tax the nanny has incurred during the current tax year outside of their employment (or indeed for a previous tax year if underpayments are to be made from lowering the nanny’s taxable allowance so that s/he effectively pays more tax). Tax refunds: On a net pay arrangement, the total amount of tax being paid over to HMRC is still being deducted from the Employee’s true gross pay. Often, in instances where tax refunds are generated the Employer sees the money as owing back to them but technically the tax rebate should be refunded to the Nanny, not the Employer. This can cause major problems between the Nanny and employer. Tax code errors and amendments: Let’s look at an example. Say a Nanny brings in a P45 from her/his previous Employer with “BR” or a low tax code (for example if she previously had 2 jobs.) Unless the full tax allowance is issued the PAYE payments will be calculated using higher amounts of tax (which in turn creates higher levels of National Insurance contributions due too). Any over paid tax should be refunded to the Nanny but any overpaid National Insurance can not be claimed back. There can also be issues where tax codes are on a month 1 basis (where previous earnings and tax which have already been paid are not taken into account). Again, any overpaid tax should be paid back to the nanny but any National Insurance that has been calculated may have been much lower had a cumulative code been in place in previous calculations. This National Insurance cannot be claimed back. You will need to cover both your Nanny’s and your Employer pension contributions! 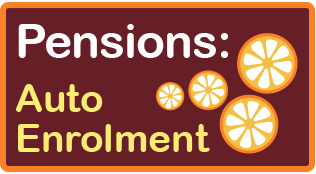 Auto enrolment is now well underway for lots of Employers and parents employing a Nanny are no exception – in most cases, you have to provide a workplace pension too! If you have agreed your Nanny’s pay on a net basis, you’ve also agreed to cover both the Nanny’s pension contributions on top of your own as the Employer. Zest Payroll Solutions strongly recommend that your Nanny’s salary or hourly rate is agreed on a gross pay basis.